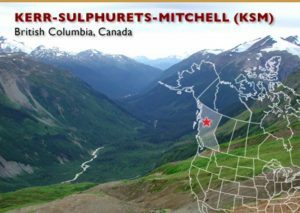 BRITISH COLUMBIA – Vancouver-based Seabridge Gold is preparing the KSM gold-copper project site for the installation of a permanent year-round camp. Exploration is a priority, but the camp will support larger work programs needed to advance project development. Small scale logging, about 9 ha, began this week in the Mitchell Valley. This will be the site of the camp, laydown area, helipad and water treatment plant. The cutting contract was awarded to a nearby company in Terrace, B.C. Seabridge is seeking a joint venture partner for KSM located 65 km northwest of Stewart. The property has measured and indicated resources of 2.9 billion tonnes grading 2.31 g/t gold and 0.21% copper for 49.2 million oz. of gold and 13.7 billion lb. of copper. Within the M&I resource are proven and probable reserves of 2.2 billion tonnes at 0.55 g/t gold and 0.21% copper. The inferred resource is 4.0 billion tonnes grading 0.38 g/t gold and 0.36% copper for 48.9 million oz. of gold and 28.0 billion lb. of copper. More information is available at www.SeabridgeGold.com.